BlackBerry Tour 2 coming soon? More evidence leaks out | BlackBerry Blast! 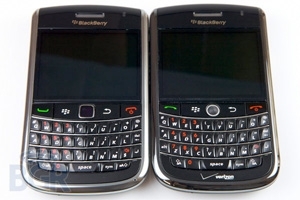 RIM has not yet even announced the BlackBerry Tour 2, but everyone seems to know it's on the way. We've seen pictures, and dummy units showing up in carrier's inventory system. BerryScoop now reports that Verizon has a .jad file for visual voicemail on their server, and file is named vvmail_9650.jad. The existence of this file does not mean the BB Tour 2 is coming soon, but it is further evidence that the Tour 2 is probably on the way at some point. We just hope it's sooner rather than later.